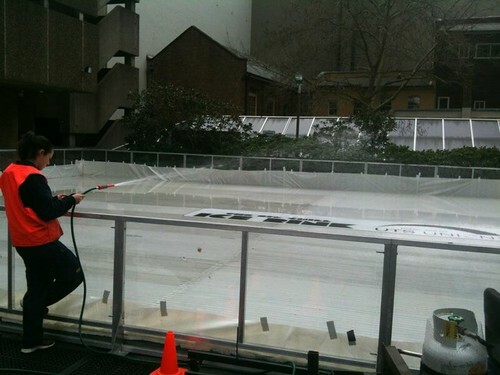 Walking past the UTS Tower Building this morning a spied an ice rink under construction. A woman stood there filling the rink with water to be frozen by the tubes running underneath. Is this what happens when lecturers tell you to ‘get your skates on‘? With a quick search, I see there is an event of from 10 to 26 August where you can book to skate for 45 minutes. This entry was posted in Photos, Uni and tagged ice rink, photo, UTS. Bookmark the permalink.